McDonald's has done it again. Its new value menu is a big hit, and customers are lovin' mobile ordering. The company beat Wall Street forecasts for earnings, revenue and sales growth in the fourth quarter at restaurants open at least a year. "2017 was a strong year for McDonald's as customers responded to the many ways we are making their experience more convenient and enjoyable," president and chief executive officer Steve Easterbrook said in a statement Tuesday. McDonald's has doubled down on cheaper fare. It launched $1, $2 and $3 value menus last month. And more affordable soft drinks and food helped boost U.S. sales during the quarter, as did the launch of buttermilk crispy chicken tenders. 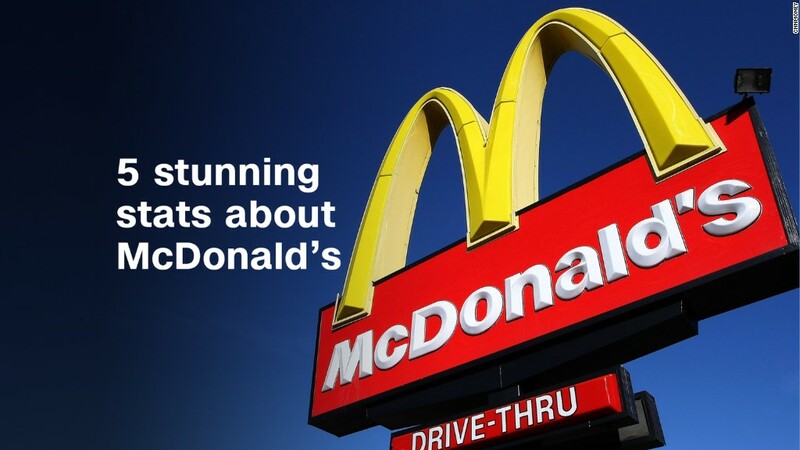 But McDonald's hasn't abandoned its attempts to attract higher-end customers. The company has had success with new premium coffees -- a move that could be hurting Starbucks (SBUX) and Dunkin' Brands (DNKN). McDonald's has been one of the hottest stocks in the Dow for the past year, surging 45%. That's better than Restaurant Brands (QSR), which owns Burger King, Yum! Brands (YUM), which owns KFC and Taco Bell, and Wendy's (WEN). One slight negative: Overall sales in the quarter were down 11% from a year ago -- but that's mainly because of a plan by McDonald's to own fewer restaurants and sell more locations to franchisees. That's hurting revenue growth in the short term, but it should lead to lower costs and will eventually boost profits as the company collects more rent and royalty payments from franchisees. Same-store sales growth, a more important number for investors, rose 5.5% around the world because of strong demand in Canada, Britain and China. It rose 4.5% in the United States. That's impressive, and it's a main reason investors are still happy with the company's new strategy. The resurgence of McDonald's is a clear sign that new menu items and an embrace of technology are paying off. Since Easterbrook took over as CEO in early 2015, McDonald's has installed self-ordering kiosks in many locations and launched mobile ordering and payment options to get customers their food more quickly. McDonald's also forged a delivery partnership with Uber through its UberEats service. The idea is to make McDonald's into, as Easterbrook calls it, a "modern and progressive burger company." And it's working. The company said Tuesday that delivery was one of the reasons U.S. sales rose so dramatically during the quarter. McDonald's isn't done, either. Chief financial officer Kevin Ozan said McDonald's plans to spend $2.4 billion to revamp restaurants, and plans to open 1,000 additional locations and invest even more in technology. Easterbrook has revamped the food offerings, too. Under his watch, McDonald's has launched fancier signature sandwiches like a kale and Sriracha sauce burger. McDonald's has also brought back the cult classic McRib sandwich for a limited time in addition to the more affordable value meals.